The newly launched Weber Spirit II E-310 Gas BBQ - brand new redesign of the popular 2013 Spirit BBQ. The extremely popular Weber Spirit BBQ has just had a complete overhaul and has been launched as the brand new Weber Spirit II BBQ! We were lucky enough to be among the first people in the U.K. to see this brilliant new BBQ, when we attended the 2018 Weber World Summit in Chicago. The Weber Spirit II E310 BBQ is the entry level 3 burner Weber Gas barbecue. This stylish Weber Grill is perfect for those looking to get into outdoor grilling and what better way of doing so, than with a Weber BBQ? 3 burners allows you to BBQ all of your favourite BBQ recipes and also for the more adventurous, give you the flexibility and ease of use to cook indirectly - the perfect technique for roasting joints of meat! This isn't just a great BBQ for those looking to learn how to BBQ on a Gas Grill, but also for those restricted on space - one of its key features is that it has a fold down side table. Stainless Steel Burners hi tech burners ensures constant heating all over the cooking area. The unique tapered shape allows a consistent gas flow from front to back of the burners for improved heat distribution. The classic Weber Flavorizer Bars are perfectly angled to catch drippings and provide smoke and sizzle to your Weber BBQ, creating the irresistible Weber Barbecue flavour and a semi circle cut out allows you to see the flame for added convenience. This helps with the removal of grease, while reducing the risk of flare-ups. Drippings that are not vaporized by the Weber Flavorizer Bars are funneled away from the burners into a disposable drip tray. Simply remove the drip tray and replace as needed. This mobile app connected feature allows you to monitor the ambient temperature of your Weber BBQ and also the internal temperature of your food. Once you've downloaded the Weber iGrill app, connect your device and run yo to 4 thermometer probes. Extremely dense, great for holding even and high temperatures, perfect for searing and enhancing the flavour of your food! 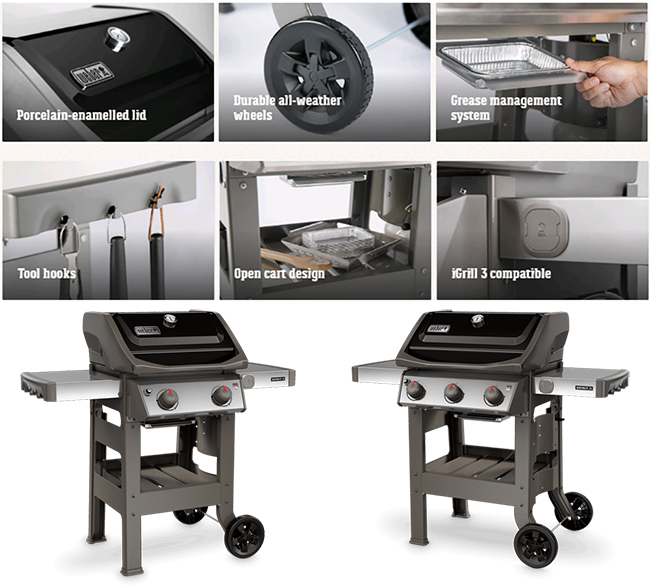 The open cart design provides good space to store your Weber Accessories. Use the side tables to keep plates or condiments at arms reach and hang your essential Weber Accessories on the hooks for easy access. The left side table folds down to fit in smaller spaces. The warming rack keeps food warn or toasts burger buns, as the main meal grills below. A rack on the outside of The Weber Spirit II BBQ allows easy access and increases the storage space in the cart which was taken up by a gas bottle in older versions.